We found the perfect land at the perfect time. Property sales are at an all time low in Central Florida. Sellers that bought land to resale at a profit are getting few offers and the offers they are getting are complicated by Lender requirements for closure. Today's Real Estate Market make alternative financing readily available to anyone with a reasonable down payment. Be creative and flexible in your offer to a seller. The best advice I would give you is don't stop looking and do use the ERA Listings. You may look at a thousand oysters before you find the pearl. Define your needs and your means. When we defined our needs with regards to land we set the property as priority and the house next in line. I was open to property with an existing house that needed some repair but not a total rennovation. It took us over a year to find property that met our needs and fit our means. I can't begin to count the number of prospects we looked at that were beyond "Handyman Specials". In my years as a Handyman I renovated several dozen manufactured homes here in Florida and they can be a waste of money to attempt to rennovate. Until we found this property and I inspected the manufactured home inside, outside and underneath I was about ready to exclude manufactured homes from the list. All that I had seen the past year were either over priced with too little land or land and a manufactured home that needed either a major rennovation or immediate replacement. We are fortunate in that this was a quality manufactured home and when this it was placed on the land it was done so with planning. The north/south exposure for energy conservation is perfect. It is located center of the 5 acres. There is total privacy from the main county road far away at the driveway entrance. And there have been no "butcher" repairs done since it was originally purchased new. The property has a 4" well with sufficent water pressure at over 100 psi to support irrigation with no problem. Most importantly the electrical circuits and plumbing are original in perfect condition. These are the two areas I have found in old homes both stick built and manufactured that have been totally "butchered" by previous homeowners. Often to the point of the electrical being dangerous. Inspection under the home revealed factory installed, code approved hurricane tie downs. Many older manufactured homes in Florida have been moved and by previous owners themselves and hurricane ties are either totally absence or severely lacking. Several properties I viewed with older manufactured homes do not hold a title for the home. Even if the home were in great shape without a title you cannot file "Homestead Tax Exemption" in Florida. This "Homestead Exemption" is $25,000.00 of your property value. There is presently an action to go to the voters to increase this double. In depth inspection identified that only minor repairs were needed and a new coat of paint inside and out. 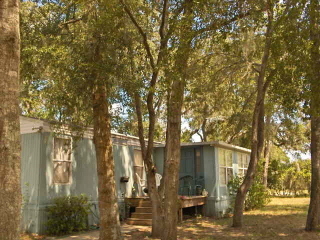 And we had no difficulty obtaining insurance on the manufactured home and property at a reasonable rate. Call before you drive. Are they open, are they there? Phone call is cheaper than a gallon. So, we found our dream property and contacted the Relator listed on the For Sale Sign and viewed the property the next day. We found that the seller had recently turned down an offer for Owner Financing that was similar to ours but with less down payment than we were prepared to offer. Overnight we discussed our offer, went back the next day to look at the property again alone. Took some pictures and went home to discuss it further. Deciding to continue with our offer I contacted the Broker and met with her at 10 pm that night to prepare the documents. This was on a Friday and the seller needed to have his attorney review the offer. Monday I received a call that the seller would accept the offer but needed a wee bit more down or a wee higher precentage rate. We opted for the wee bit higher down to keep our interest rate and the offer was accepted. Closing took place on the 19th of August 2007 and ASWEGO HOMESTEAD was born. By obtaining owner finance we got a fair interest rate without haveing to deal with a lending instution and the associated applications, required inspections, credit reports, closing cost and red tape. The entire process was handled by our Broker, Theresa Morris and the seller's attorney perfectly and fast!!! From first look at the land to acceptance of deal, which also constituted our loan approval took less than a week. Closing went without flaw as scheduled. Don't think that just because you are retired on a fixed income you can't find financing. In today's market Owner financing is a great option for both the seller and the buyer. It's a win-win situation. If you are considering homsteading or just buying property in Central Florida I would highly recommend our broker. Hello and thank you for visiting ASWEGO website. I hope you enjoy visiting and do come back. I have three months of progress here on the homestead to get posted. I think you will find something you like if you are a homesteader at heart. This about brings you up until the day we began moving our stuff and two storage buildings to the property. Now comes the fun part, the problems and solutions of nearly 90 days of work. I have certainly discovered several problems that needed addressed and have fixed those in sometimes a semi-permanent manner. You will understand better the need for semi-permanent fixes when you read about the unforseen expenses from the past 90 days!!! Copyright aswegohomestead.com. All rights reserved.